Special $5 Flat Rate Shipping for Continental 48 US States - Enter Code pickle4ship at checkout. Limit 3 per customer. The pickle ornament was a special decoration in many German families where the tree was decorated on Christmas Eve. The pickle was the last ornament hung on the tree. The story tells that the pickle was hidden somewhere in the green boughs of the Christmas tree by parents. 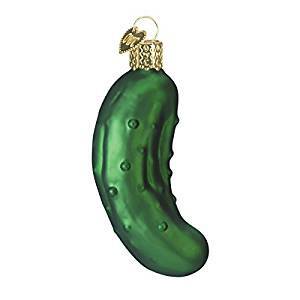 When the children were able to view the Christmas tree, they all knew that the one who first found the pickle ornament on the tree would receive an extra gift left by St. Nicholas for the most observant child.